But for those outside the Wasatch Front area, "Salt Lake radio" is generally synonymous with one set of call letters: KSL. There's a good reason for that: KSL is the oldest radio station in the state, having signed on way back in 1922 as KZN, the radio voice of the Deseret News, itself the media voice of the Mormon church. Changing calls first to KFPT and then, in 1925, to KSL, the radio station eventually separated from the newspaper, but remained under the ownership of the church. With the addition of KSL-TV on channel 5 in 1949, the stations opened "Broadcast House" on Social Hall Avenue in downtown Salt Lake City. 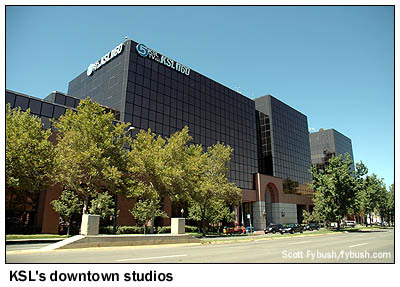 For more than two decades, that short block near Temple Square was home to all three of Salt Lake's TV stations, as well as KLUB radio, and even after the other stations moved out to the suburbs (we'll follow that trail in next week's installment), KSL stayed in the city. In 1983, it left its old "Broadcast House" on Social Hall for the current "Broadcast House," part of the Triad Center office development at 55 South 300 West, just west of downtown. 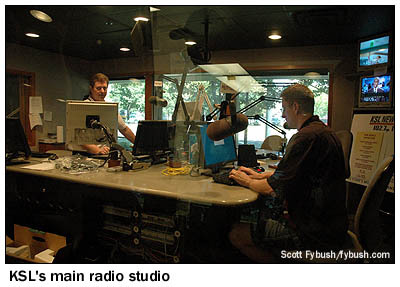 We were fortunate to be able to visit the KSL studios in the company of chief engineer John Dehnel, as part of a tour organized by the International Radio Club of America, whose 2007 convention was the whole reason we were in Salt Lake in the first place. KSL occupies several floors of the "Broadcast House" building, starting with a dramatic atrium lobby decorated with a stained-glass NBC peacock (a relic of a 1995 shuffle that saw KSL-TV move from its longtime CBS affiliation over to NBC) and with ventilation grates embossed with KSL logos. Our tour starts upstairs, where an L-shaped row of radio studios houses most of the radio operations in the building. Today, KSL's parent company, Bonneville Communications (also headquartered here at Triad Center), owns not only KSL and KSL-TV but also three FM stations in the market: soft AC KSFI (100.3 Salt Lake City), classic rock KRSP (103.5 Salt Lake City) and KSL-FM (102.7 Midvale), which had been doing AC as "Star 102.7," KQMB, before Bonneville decided to put KSL's news-talk programming on both AM and FM in hopes of reaching a younger audience. 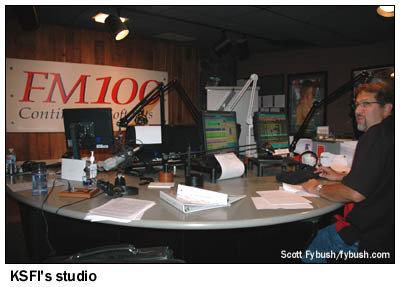 KSFI ("FM100") was the former KSL-FM, which Bonneville had sold to Simmons in the seventies, then repurchased (along with KQMB and KRSP) in 2003. KSFI continues to be heard statewide via a network of translators that dates back to the KSL-FM days. KRSP-FM ("Arrow 103.5") was part of the Carlson family broadcasting group, along with KRSP (1060, now KDYL and still owned by the Carlsons) and shortwave rocker KUSW. 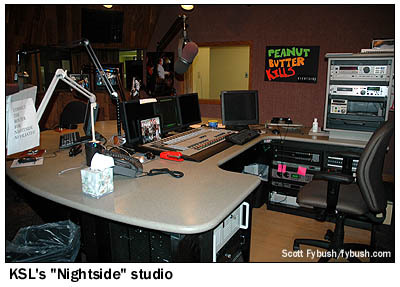 KSL radio used to have its studios up here as well, until a renovation a few years ago that moved them downstairs to street-level studios adjoining the KSL-TV newsroom; even now, some of KSL's talk programming, most notably the "Nightside Project" evening show, continues to originate upstairs. Downstairs, KSL-TV's operations span both sides of the lobby. 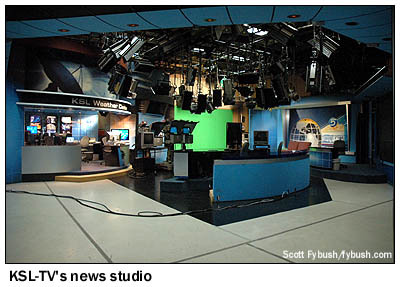 To the right of the lobby, hallways lead back through KSL-TV's engineering and master control areas, then back to two large TV studios used for non-news productions, including the morning talk show "Studio 5." On the other side of the lobby, KSL's newsroom fills much of the first floor. 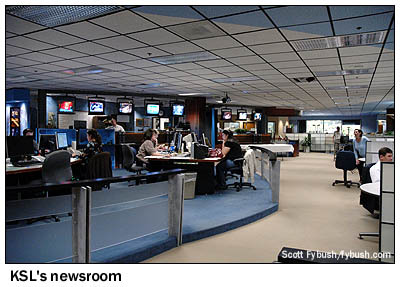 The news studio is open to the rest of the newsroom, as well as to a viewing gallery upstairs that's regularly used by tour groups. Behind the TV assignment desk sits a radio producer's area, which in turn backs up to the KSL radio master control and talk studio, which look out to the street. 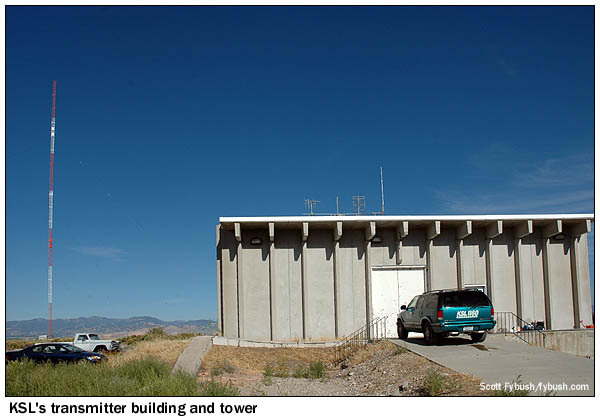 As impressive as Broadcast House is, the real action - tower-wise, at least - happens about a dozen miles to the west, in the salt flats along the shore of the Great Salt Lake, at the transmitter site KSL has called home since 1933. 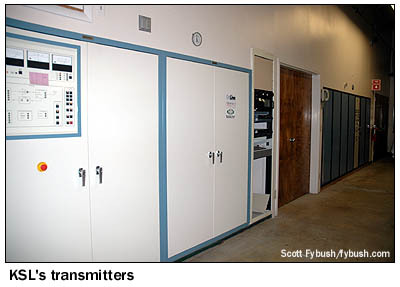 If the transmitter building shown above doesn't look like it's vintage 1933, there's a good reason for that: it isn't. 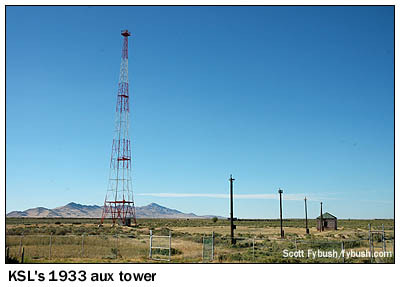 The current transmitter building sits next to the site that was occupied for many decades by an Art Deco building that was literally constructed around a Western Electric 407A4, a mighty beast of a transmitter that required an entire building to hold it. 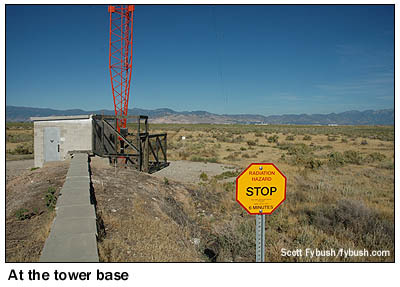 The main tower is reached over a causeway of concrete blocks that sit atop the transmission line. Why a causeway out here in the desert? While the edge of the Great Salt Lake is more than a mile away on this dry August afternoon, the lake does flood every few years, and there have been times when the engineers have needed to use a boat to get out to the tower base. So where are KSL-FM and KSL-TV? 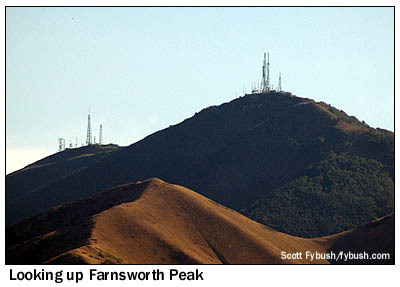 9000' above sea level and just a few miles southeast of the AM transmitter site, as it happens, up in the Oquirrh Mountains at a site known as Farnsworth Peak, after television inventor Philo Farnsworth. 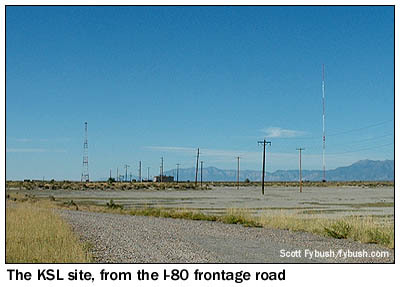 We'll run into Philo again before our trip is out; sadly, we're not able to make it up Farnsworth to see the KSL-TV tower complex (at the right of the photo), which is now also home to the "DTV Utah" community site that transmits most of the market's DTV signals. There's also an FM master antenna up here that carries Bonneville's three FMs and ten others, plus the "Little Farnsworth" site (at left) that's home to Fox's KSTU (Channel 13/DTV 28). It's a busy place, and we hope that someday we can get up there - and to the Mount Vision/Pix Peak site a couple miles to the south that's home to several more TV and FM signals. Want to hear what all those FMs sound like? Join us Wednesday over at Tophour.com, where we'll continue posting all the audio we gathered in Salt Lake and vicinity - and return here next Friday for part three of our Big Trip, where we see a few more Salt Lake stations, as well as the Ogden area to the north and the Provo area to the south. Thanks to John Dehnel for the KSL tours!